Paul D’Amato, editor of the International Socialist Review, answers the objections of several left-wing writers who critiqued the People’s Climate March. HUNDREDS OF thousands of people–some estimates ranged above 300,000–gathered in New York City September 21 to protest government inaction on climate change, ahead of a United Nations climate summit held two days later. Contingents came from all over the U.S., representing a broad range of activist constituencies, including Native Americans, unionists, students, immigrant rights activists, scientists, war veterans and socialists. The protest also included a number of prominent actors and politicians, including Leonardo DiCaprio, UN Secretary General Ban Ki-moon and former Vice President Al Gore. Even President Obama–who many environmental activists have criticized for his support of the oil and gas industry and his failure to effectively address climate change–announced his support of the march. The day before, some 2,500 people attended the Climate Convergence, a day of plenary discussions and workshops that linked the fight for climate justice with the struggles against capitalism, colonialism and racism. Author Naomi Klein, whose book This Changes Everything: Capitalism vs. the Climate has just been published, spoke to 800 people there. Then following Sunday’s protest, as many as 2,000 protesters engaged in civil disobedience on Wall Street. Dubbed “Flood Wall Street,” the action was aimed at drawing a connection between capitalism and the climate crisis. YET PRIOR to the march, some left-wing writers expressed a critical, if not openly dismissive, attitude toward it. The gist of the criticisms was that march organizers played to the political “lowest common denominator” to draw in the largest numbers of people possible; failed to have clear demands; were too willing to cooperate with police to set a march route; utilized the services of an NGO using a business model of organizing; and allowed do-nothing politicians and corporate fronts to endorse the march. Another criticism was that this was a purely “symbolic” protest that, by gathering two days before the UN summit was set to meet, failed to effectively challenge the government and corporate forces responsible for climate change and for stalling action against it. In this absurd comparison, Saul seems unable to discern the difference between “First World” activists trying to challenge the status quo and “First World” rulers who defend it. And there is no place in this condemnation to explain the Indigenous organizations that stood at the front of the march, the presence of a pro-Palestinian rights contingent, or the immigrant rights and anti-racist groups that attended. The vast majority of people in the U.S. are not in control of the industrial and commercial processes involved in the incessant drive for profits that leads to high carbon emissions. As individuals and as consumers, we don’t possess the power to alter this. We do, however, have power as activists and as workers to change it. And it is precisely these sorts of people who came out in enormous numbers to the climate march. THERE ARE things to criticize about the march and its organization–and some of those outlined by Gupta and the others are on target. But the depiction of marchers as dupes of a sinister corporate campaign betrays an elitist view about ordinary people and their supposed gullibility. And criticism of “symbolic” protests as a waste of time fails to understand the role of such mass demonstrations in helping to building larger ongoing movements. You can’t conflate the politics and interests of one part of a big protest with the protest as a whole–which, as a mass gathering, brings together disparate forces with divergent agendas on how to tackle climate change. The Climate Group was one of 1,500 “partnering” organizations with the People’s Climate March–alongside much more radical organizations, such as, ironically, Saul’s Ecosocialist Horizons. A demonstration is not a movement, but this one clearly reflected the development of a whole host of burgeoning local and national struggles and groupings across North America–against fracking, for indigenous rights, against the Keystone XL pipeline, for college divestment from fossil fuel companies, and so on. The immediate precursor to the march was the demonstration and mass civil disobedience at the White House last spring, where 400 people, mostly youth, got arrested. Moreover, the leaders of the climate movement themselves have shifted. The spring action at the White House was a direct challenge to Barack Obama, and more and more dedicated activists are questioning the Obama administration. Tens of thousands of people have pledged to take part in civil disobedience if Obama approves the Keystone XL Pipeline, and 350.org founder Bill McKibben has been increasingly critical Obama’s pro-fossil fuel policies. Does this mean that McKibben has broken sharply with the Democrats? No, but what is new and different about 350.org is that, rather than folding up shop under a Democratic administration–with the argument that we must not do anything to “embarrass” the president), they are taking action. This is quite a departure from more traditional liberal organizations that have failed to act under similar circumstances. Whatever the political limitations of 350.org, it has helped capture and organize a growing sentiment that more meaningful action is necessary to force action on climate change. THE DISMISSAL of the protest also fails to grasp the role of mass demonstrations in helping to build larger movements and in radicalizing their participants. First of all, there are the well-understood benefits–they help publicize the cause; they allow activists who don’t normally see each other to network; they bring together larger forces so that they can feel the size and potential strength of their movement; they promote a sense of solidarity between what are usually separate and localized sets of movements and constituencies; and they energize participants and give them more confidence to continue fighting (see “Why Protests Events Are Not a Waste of Time”). All of these factors aid the left, not the moderates, in the movement. The march organizing–which included some mass meetings of hundreds of people each–has helped facilitate and strengthen connections and on-the-ground organizing. Perhaps even more significantly, this is the first climate justice demonstration in which organized labor has played such a central role. A number of unions signed on to the demo, and this helped crack open a debate inside unions about the role labor should take, with unions like the IBEW being put on the spot about their pro-coal positions. Labor is going to have to play a key role in any successful climate justice movement, so this, in and of itself, represented a step forward. Groups of hundreds of people from remote places travelled together to this march–breaking through isolation to develop confidence and make their voices heard. All of this represents positive steps that the march accomplished. So, yes, the left needs to be there to strengthen this, to put forward our critiques, but also to be involved in the debates and struggles among activists who are already radicalizing. Set-piece, peaceful demonstrations are not always tame. In February 2003, a permitted, peaceful march was organized in Manhattan against the impending war against Iraq, drawing half a million people. When police at several stepping-off points for the march tried to barricade protesters in and prevent them from joining the main body of the demonstration, the crowd–with encouragement from socialists and radicals–overran the barricades and pushed past dumbfounded police. As movements develop in size and their degree of radicalization, those at the top will seek ways to contain and safely channel protest, but there will always be the creative counterweight–the potential for unpredictable outbreaks, even in the most “tame” of protests. 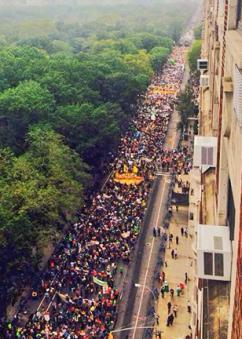 SOME OF the critics of the People’s Climate March seem to put too much weight on what such protests can accomplish. Clearly, mass demonstrations by themselves rarely achieve fundamental change. The 2003 demonstration, despite its enormous size, didn’t stop the Iraq war. The truth is that mass demonstrations are rehearsals for revolution: not strategic or even tactical ones, but rehearsals of revolutionary awareness. The delay between the rehearsals and the real performance may be very long: their quality–the intensity of rehearsed awareness–may, on different occasions, vary considerably: but any demonstration which lacks this element of rehearsal is better described as an officially encouraged public spectacle. [R]iding the subway uptown this morning, protesters packed the train cars at every stop–at 34th Street, a cheer went up as we pulled in to find a wall of marchers waiting to board. My mom was gleeful, her enthusiasm infectious. And the sheer scale of the march when we arrived–its energy and creativity–was overwhelming. It’s not that protests will win these fights. But there is power–and joy–in taking the fight to the streets. Sometimes you just have to stand and be counted. Short of the reemergence of a mass left, the majority of national protests in the U.S. will be led from the front by liberal forces in the main. We will not alter this situation by standing apart from them–we will merely concede the political stage to the moderates and cut ourselves off from those we should be trying to influence. It’s as if the critics of demonstrations such as the climate march have forgotten that they themselves once had illusions in the Democratic Party, a more “humane” capitalism and so on–and they now see themselves as the ones who “get it,” in contrast to the mass of people who don’t. This sounds very radical, but in practice, it creates a complacent separation, where liberals are left to dominate certain political arenas, while the radicals must go off and create theirs. This separation is reinforced by the fact that at least some of the climate march critics think we can fundamentally alter our social relations by prefiguring the future society we want to create–for example, among his prescriptions for a more radical climate justice movement, Quincy Saul calls for “local work to divorce food, water, shelter and energy systems from capital.” This utopian concept of change is actually far feebler than mass protest. SOME OF the march critics think that they proved that last Sunday’s demonstration was futile by calling it “symbolic.” The mass march was, indeed, symbolic. But this is also often true of civil disobedience. Occupy Wall Street, with its focus on the occupation of public spaces, was also symbolic–its primary organizing principle was a symbol of our potential power rather than an expression of our real power to control public spaces. Indeed, many Occupy activists were positively proud of the fact that the movement didn’t have demands, seeing the occupation of public space as the goal in itself, rather than a means to achieve goals. Many of the writers who looked with skepticism on the Sunday demonstration were enthusiastic about the Flood Wall Street protest, which invited people to wear blue and engage in civil disobedience on Monday in lower Manhattan. Yet this was also a symbolic protest. It had no practical demands, but organized under the slogan “Stop capitalism; end the climate crisis.” We, of course, agree with this slogan. But we also understand that at this stage of our social movements, the slogan is a propaganda statement. It is unlikely that anyone involved seriously thought that this action on Monday had any hope to “shut down the institutions that are profiting from the climate crisis,” let alone “stop capitalism”–except symbolically. The desire of growing numbers of activists to engage in civil disobedience and mass disruption of “business as usual” is an extremely positive development. But tactics should not be treated in isolation from the question of how to mobilize the social forces necessary for our side to win. Though both are important, neither peaceful protest nor civil disobedience–nor “uncivil” disobedience, for that matter, will by themselves force the changes that we seek. Our discussion of tactics should take place in the context of a discussion of social power: who and what are the social forces capable of winning fundamental reform, and beyond that, fundamental transformation of the system that causes climate catastrophe. For that, mass action in many forms–marches, pickets, blockades, occupations, sit-ins and, in particular, the mass action of the working class in the form of strikes–will play a role. However, only by working and struggling alongside others–people who are grappling for radical solutions, but are also still marked with illusions in the existing state of affairs–can we hope to organize social forces in the numbers necessary and with a consciousness capable of bringing about that fundamental change. Next Post: “Converge for System Change” at the People’s Climate March!